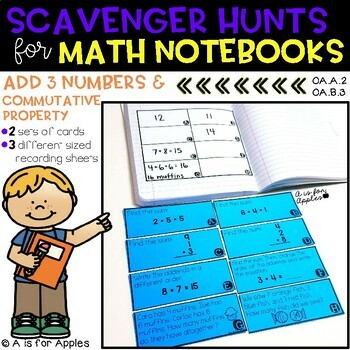 These scavenger hunts will get students moving around the room while practicing math skills! This set includes skills for practice with adding 3 whole numbers and the commutative property. 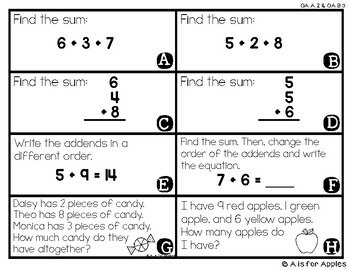 Students will practice adding 3 numbers with sums up to 20 and understanding the associative property by adding two of the numbers to make 10 first. Students will also practice the commutative property by switching the order of addends. 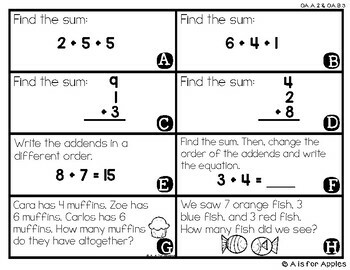 They will also practice solving word problems with three addends. Print 1 set of scavenger hunt cards to use at a time. You may choose to print on colored paper and laminate the cards as well. Hang the cards up around the room. Choose which size recording sheet your students will use. 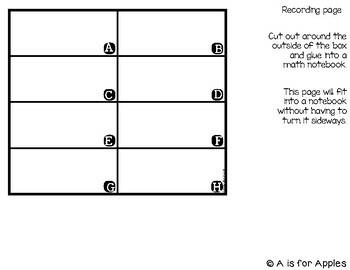 2 of the recording sheets will fit into your students' math notebooks. Students will walk around the room to the cards and write the answer to the problem on their recording sheet. There are 2 sets of cards so you can do this activity twice. These scavenger hunt activities are a great resource to use during math centers. Students can work independently or with a buddy to complete the activity. Check out the preview to see more about the contents in this pack.